The SAFe Fellow program is a key aspect of our enterprise enablement strategy, especially when it comes to supporting enterprises tackling the most challenging implementations. 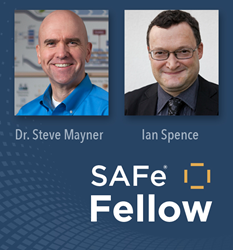 Scaled Agile, Inc., provider of SAFe®, the world’s leading framework for enterprise agility, today announced the induction of two new Fellows into the SAFe Fellow program: Steve Mayner and Ian Spence. The SAFe Fellow achievement is Scaled Agile’s most prestigious distinction, recognizing individuals who have exhibited the highest levels of thought leadership and transformational expertise for implementing the Scaled Agile Framework® (SAFe). The new inductees have met the SAFe Fellow requirements based on their ongoing contribution to the evolution of the Framework, their demonstrated success implementing SAFe in a broad range of industries and disciplines, and their willingness to share their expertise publicly through writing and speaking. —Dr. Steve Mayner, SPCT, Senior Consultant, Scaled Agile, Inc.
A 29-year veteran in information technology, Dr. Mayner is an executive coach and Lean-Agile evangelist with a passion for cultivating transformational leaders and high-performing teams. His career in business includes roles as Vice President in multiple Fortune 500 companies as well as Chief Technology Officer for an internet startup. His research on the correlation between transformational leadership behaviors and the factors that contribute to successful organizational change was the first of its kind in the specific context of Agile and DevOps. As Product Owner of Scaled Agile’s new SAFe in Government course—currently in development—Dr. Mayner is driving Scaled Agile’s initiative to help government agencies achieve better business results by implementing Lean-Agile practices at scale. Spence has led hundreds of organizations in their Agile transformations. He is an experienced Agile coach, consultant, team leader, analyst, architect, and scrum master, and has practical experience of the full project lifecycle and a proven track record of delivery. Spence is an active contributor to SAFe and regularly writes informative blog articles and has contributed content such as the Feature Slicing poster. He is coauthor of “Use Case Modeling” and “Managing Iterative Software Development Projects,” and is the team lead at SEMAT, an initiative to create a common ground of theory, principles, and practices for software engineering. He has helped large enterprises apply SAFe practices, including Schneider Electric, Nordea, Deutsche Bank, Sony Interactive Entertainment, and Ericsson Modems. Learn more about the SAFe Fellow program at scaledagile.com/safe-fellows. Scaled Agile, Inc., is the provider of SAFe®, the world’s leading framework for enterprise agility. Through learning and certification, a global partner network, and a growing community of over 200,000 trained professionals, Scaled Agile helps enterprises build better systems, increase employee engagement, and improve business outcomes. Scaled Agile is a contributing member of the Pledge 1% corporate philanthropy and community service movement. Learn about Scaled Agile and SAFe at scaledagile.com and scaledagileframework.com.